I (Kyle) am feeling super Canadian today. Women's curling is on TSN, my friends from Winnipeg are in town to play some hockey, the Oilers have inexplicably won some games recently and I am hungover. Just like old times. In the spirit of things, I am jumping on AK's bandwagon (that's what she said?) and running not one, but two caption contests today. 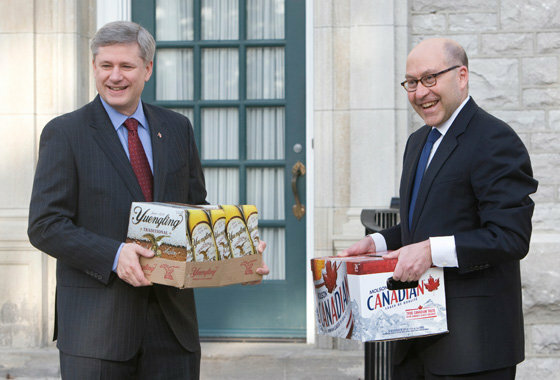 The first features two former interests of mine; Canadian politics and beer, as Prime Minister Stephen Harper accepts beer from the American ambassador (David Jacobson) to Canada after winning the bet on the Olympic gold medal hockey game. Which way to sorority row? If you are smart enough to tie your shoes, you can easily beat my lame attempt. The winner of this contest will receive the Canadian song of their choice from iTunes. You can even pick Celine and anyone can enter, even Drew Mindell. 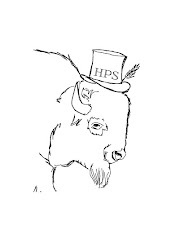 Contest closes Monday morning, 10:00 a.m. Central. Good luck! HARPER: "All right, Dave, if you pick up the cigars we'll be ready for the next time the Canadian women win the Olympics." DAVID: All right, Steve, we want to know all about the Canadian healthcare system. STEPHEN HARPER: Sure, but we'll definitely need beer for this. Canada: better hockey, better beer. Ok, now that we can access blogger again, we have declared Matthew the winner. Congratulations Matthew. Please contact Amanda or me and we will get you your song toute suite.